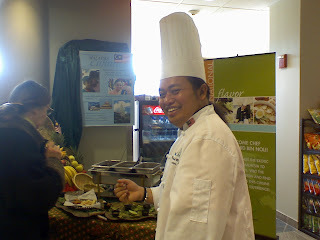 I had the pleasure of meeting a visiting chef from Malaysia at UVM's Davis Center. Chef Norrashid bin Noli was only here for one day but I had the opportunity to try his chicken rendang dish with gado-gado and satay sauce. It was awesome and brought back memories of Malaysia. Thank you to Chef Paul Bihan who paid for my lunch. I've got Norrashid's personal contact info and will contact him when I visit Kuala Lumpur in January 2009.